Welcome to part two in The A.V. Club’s four-week guide to kids’ shows that parents can actually stand. We’re saving you the trouble of slogging through shows like Chuggington and The Mickey Mouse Clubhouse as you search for decent kids’-age television (you’re welcome). We’re even adding accompanying reading material where available. Last week, we delved into the somewhat-frightening world of pre-K watches, from Blue’s Clues to Wonder Pets! Things perk up a bit this week with some shows that you may even watch when your kids aren’t around (like a Phineas And Ferb two-parter). Who knew Curious George would be a gateway to science? Who knew English accents were so endearing? Who knew Arthur was even still on the air? Next week, we’ll look at shows for second and third graders. And in week four, we’ll list kids’ shows to avoid at all costs. Dora The Explorer, we have you in our sights. Jim Henson created the “noble race of Fraggles” with nothing less than the goal of world peace in mind, in the midst of the U.S. versus Russia arms race in the ’80s. To that end, the show was co-produced by British television company Television South and the Canadian Broadcasting Corporation, knocking off three countries just with production. Fraggle Rock then ran on HBO as the cable network’s very first series. As the Fraggles interacted with the hard-working Doozers, the giant Gorgs, and the “Silly Creatures From Outer Space” (Doc and Sprocket in their workshop), the show sneakily wove in concepts like democracy, monarchy, and isolationism. Henson explained in a 1987 documentary about the show: “By seeing how the various groups in the world of Fraggle Rock learn to deal with their differences, perhaps we can learn a little bit about how to deal with ours.” Your kid may want to get acquainted with this charming series before the upcoming movie with Joseph Gordon-Levitt. It might also offer a chance to discuss political science before your child is even in second grade. Audiences first met Paul Reubens’ Pee-wee Herman character in a slightly risqué HBO special and some Letterman appearances, though most of his rough edges were smoothed away for Herman’s half-hour TV series for kids. But the mania remained intact, even as it was encased in the crazy titular house, a daily secret word, and characters like Chairy, Globey, and the lovely Miss Yvonne. Pee-wee’s imagination offers plenty of inspiration for kids’ own playdates—from playing house to trips to the moon—and even adds ideas for snacktime. More than a little trippy—Pee-wee might start walking upside down on the ceiling just for the hell of it, and the King Of Cartoons always offered bizarre animated features—and wholly original, Pee-wee’s Playhouse now offers the perfect blend of nostalgia for parents and hilarity for kids. Only Sesame Street outranks Arthur, Marc Brown’s aardvark without a nose, in terms of PBS Kids longevity. The show, based on Brown’s popular series of books, still features the Read family and their friends grappling with typical grade-school issues, with two stories per half-hour. Arthur raises the stakes with the show’s inspired parodies of everything from The Sopranos (“The Altos”) to Toy Story 2 (“Doll Story 2”): It recently kicked off its 19th season by using “Fountain Abbey” to take a valuable look at class differences. The longevity of the show has caused some followers to protest various voice cast rotations. But the show’s adherence to working with child actors and offering insightful social lessons (Arthur and his friends have frequent disagreements and misunderstandings but always make up at the end) means that Arthur will undoubtedly soon pass into its third decade. Suggested reading: Child’s creations have spawned a cottage industry, including some excellent sticker books. But for your kids’ literary needs, stick with the volumes that spawned the series, like I Will Not Ever Never Eat A Tomato and I Am Not Sleepy And I Will Not Go To Bed. Availability: BBC, YouTube, Disney Jr.
PBS Kids does a commendable job of pushing science with shows like Sid The Science Kid (also from The Jim Henson Company) and The Cat In The Hat Knows A Lot About That, with the Cat voiced by Martin Short. But the public-television version of Curious George may make these concepts the most accessible to your youngster. Curious George offers two stories per half-hour in which George gets into problems but figures them out using science concepts like hypotheses and control groups. Expertly narrated by William H. Macy in the early episodes, the show features animation that rivals Curious George’s feature films. He’s a bit adventurous though, which is why this show might be better for 5-year-olds than 4-year-olds who won’t actually try to climb up flagpoles or turn your bathtub into a turtle habitat. Live-action experiments end every segment, and may offer ideas for future science fairs. Suggested reading: Again, stick with the source material: The original books by H. A. and Margret Rey include George’s definitive adventure, which remains the time he visited outer space in Curious George Gets A Medal. Continuing our PBS Kids juggernaut, WordGirl rules the vocabulary department. Each half-hour features two stories that highlight two new vocabulary words each. Young superhero WordGirl fights villains like Dr. Two-Brains and Lady Redundant Woman as she weaves these new multisyllable words into her stories. WordGirl also features a stellar voice cast with familiar names like Chris Parnell, Jeffrey Tambor, and Patton Oswalt. A game show at the end of each episode reinforces the words’ meanings so your kids won’t forget how to use terms like “impolite” and “berserk.” The humor usually stems from the interplay between the ridiculously straitlaced adult characters (the parents, the mayor) and the kids. The deadpan delivery in this superhero satire highlights the wordplay, resulting in a show any generation in your house will find entertaining. You may weep with relief by the time Phineas And Ferb rolls around. It’s truly one of the first shows that parents and kids can enjoy in equal measure. For years now, the two brothers of the title have been attempting to get the most out of their summer by building roller coasters, piloting space ships, and offering sendups of Disney properties like The Avengers and Star Wars. The kids will like the boys and their ambitious plans, but parents will likely gravitate toward the dastardly villain Dr. Doofenshmirtz, who longs to take over the whole “tri-state area” through the use of one of his many “-inators.” Guest stars, such as Sandra Oh, Allison Janney, J.K. Simmons, and Lorenzo Lamas are exemplary. 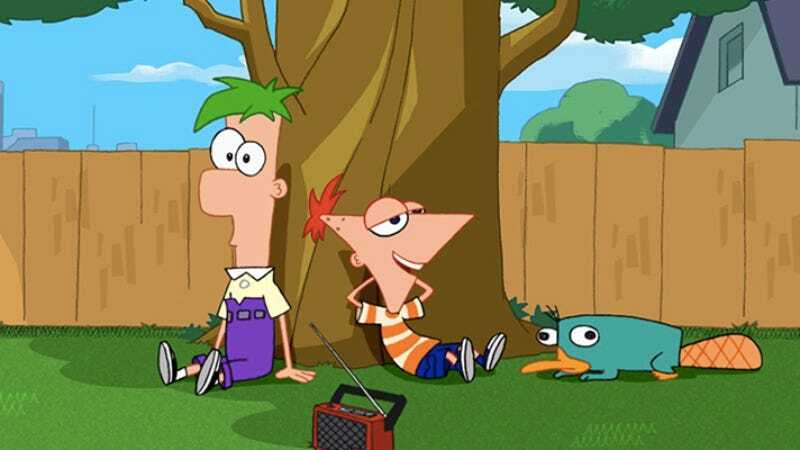 The songs—especially by ’80s throwback group Love Händel—are so catchy that the Phineas And Ferb soundtrack may also turn into your kids’ first album. Luckily, this show is on about a million times a week via the Disney Channel. The Kratt brothers, Chris and Martin, already had the greatest jobs in the world when they hosted Zoboomafoo, a show that introduced kids to various animals with the help of a lemur puppet. Then, the Kratts took it up a notch and animated themselves into Wild Kratts (which they also write and direct), exploring a different type of creature every episode. The animated Kratts are also able to turn themselves into animals thanks to special suits powered by “creature discs.” The real-life Kratts bookend the story with visits in the wild to baby pumas or tiny chameleons and then delve into the animated tale. This addictive show is beyond educational: Your kids will soon know more about Monarch butterfly migration or the symbiotic relationships between rhinos and birds than you ever have.